Presidents Putin and Obama presented two radically different worldviews at the UN yesterday morning, but both obliquely described the other as the key cause of global unrest. Putin took aim at the United States, implying that the Arab Spring was orchestrated by the United States and that sanctions on Russia are undermining global trade, while President Obama called for a return to the rule of law, and lambasted human rights violators. These disagreements reportedly carried on into the private meeting held by both leaders last night on Syria and Ukraine. But the root of the disagreement on Syria isn’t differing objectives: both Russia and the United States want to see ISIS contained and degraded, and an end brought to the terrible conflict in Syria and Iraq. The difference lies in the means both sides want to use to achieve this objective. The Russians want to protect the sovereignty and power of the Assad regime, while U.S. leaders insist that Assad must go, to be replaced with a government which includes representation from the Syrian opposition. Given this agreement on ends - if not on means - it’s in the interest of both sides to continue to discuss Syria to see if common ground can be found. And Russian involvement in Syria is not necessarily a bad thing for the United States for a couple of reasons. Firstly, Russian involvement against ISIS could actually be more effective than U.S. involvement, if only because the Russians have a reliable allied military on the ground. Secondly, violence has actually dropped in Eastern Ukraine, as Russia shifts its attention and military resources towards the Middle East. Both sides have signaled the possibility of some diplomatic flexibility. Putin called in his speech for an anti-ISIS coalition similar to the one which defeated Nazi Germany. And in his press conference following last night’s meeting with President Obama, he said both that there was a great need for further U.S.-Russia bilateral cooperation, and that any solution in Syria must involve a political reform process (although he believes the Assad regime should be part of this process). For his part, President Obama did not call for the immediate overthrow of the Assad regime, instead calling for a ‘managed transition’ to create a more representative Syrian government. None of this suggests that disagreements don’t exist on Syria; they are in fact numerous and challenging. Yet it is to be hoped that the United States and Russia will continue to talk about these issues. As one of my colleagues noted last week, a lack of general diplomacy with Russia is counterproductive and resolves no problems. In the case of Syria, cooperation between Russia and the United States is far more likely to yield a positive outcome than any other approach to the problem. 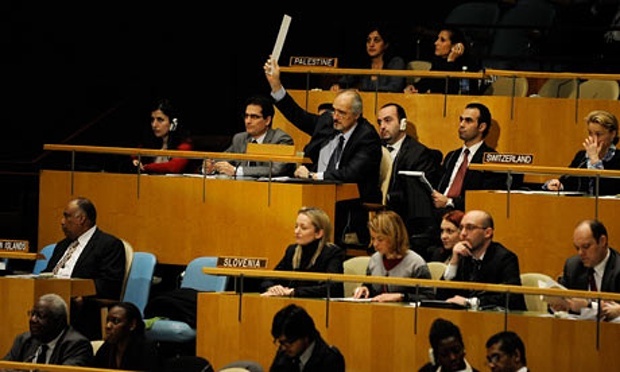 Image: Bashar Ja'afari, the Syrian ambassador to the United Nations, calls a point of order before the general assembly voted to condemn the violence in Syria. Emma Ashford is a visiting research fellow with expertise in international security and the politics of energy. She is an expert on the politics of petrostates, including Russia, Saudi Arabia, Venezuela and Iraq, and has written widely on Russian foreign policy and the politics of the Middle East. Her dissertation research focused on the ways in which oil production and export shape foreign policy and conflict. Ashford holds a PhD in foreign affairs from the University of Virginia, and an MA from American University’s School of International Service.